Two hundred and thirty-six years after the Great American Revolution, there is another revolution in progress quietly sweeping its way across our nation. There are no marching bands or shots fired across the Potomac, but instead a subtle effort by a few, including movie stars and politicians, to improve our habits and reduce our shredded nerves in classrooms, hospitals, and yes, even in our military. This growing interest in calming our minds and selves and relieving our tremendous collective stress using peaceful, non-pharmaceutical methods was recognized by 5-term Congressman Tim Ryan (D-Ohio) a few years ago while at a mindfulness and meditation retreat held by Jon Kabat Zinn in Western Massachusetts. Being ramped up all the time is making us sick, he declared. “Kids are sending 3-to-4,000 texts a month,” and neither can we adults be parted from the world of instant communication and computer screens. What can this be doing to our levels of attention not to mention true human connectivity and intimacy? We know by now that stress not only decimates our central nervous systems and invites illnesses, which not only inflame and devour our cells, but also damages the brain’s Amygdala. This little inch-wide, almond-shaped, power-packed nuclei cluster located in the center of our brains has functioned as our primary stress response mechanism, serving our species well until…now. We don’t need to live like this. It, and we, need calming. It’s true that one can’t avoid real life. But do we really need to be so busy and driven all the time? Happily, there is a growing undercurrent of awareness slowly taking hold. Many local hospitals have begun offering mindfulness programs to help their doctors deal with the daily doses of trauma and anxiety. My friend’s children attend a kindergarten in Santa Monica, California that teaches yoga and meditation for a few minutes a day. Actress Goldie Hawn’s foundation is developing programs to help children “find happiness and success in school and in life.” Her programs are currently implemented in over 1,000 schools. It’s happening. During the mindfulness retreat, Ryan found that the more he focused on his breath, the rhythm of his walking and natural surroundings, the greater a sense of spaciousness enveloped him. He found his thoughts became less compelling, and those constant interior conversations we all have in our heads quieted down. It may sound complicated or difficult, but it really isn’t. And the results are profound. 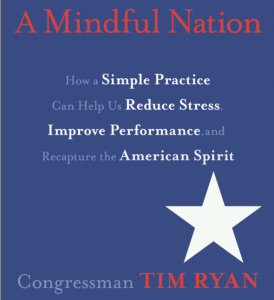 As a member of the House Armed Services Committee, Ryan is taking his mindfulness message to the military to help our service men and women. According to the Department of Defense, more than one million U.S. troops served in Iraq and over 60,000 troops are currently stationed in Afghanistan, for an on-going military conflict that has introduced a whole new series of physical and emotional wounds. To help minimize emotional stress and achieve a sense of peace in hostile environments, soldiers are now being shown mindfulness skills before they deploy overseas. At the Mind Fitness Training Institute in Washington D.C. , service men and women are taught to experience the sights and sounds around them, and how to understand how their minds are reacting in different situations, which can help maintain a sense of centeredness in any situation. Congressman Ryan is also discussing the use of mindfulness techniques with members of the military to help soldiers deal with post-traumatic stress. The message is practical. It’s not that we need to become miniature Buddhas or master yogis, although one may arrive at that state of total bliss and oneness eventually. It’s just a little way to add a ribbon of calm into conscious thought—whether you are a member of the military, work with hospital patients, go to school or are simply trying to bring a finer dimension of peace and happiness into your life. It’s a start and a step in the right direction. To begin, one just needs to start paying attention, a familiar refrain we all heard in school. Then start by taking time out of your day. Even 10 minutes, twice a day, does not require a muezzin’s call to prayer, but quietly, privately, even excusing yourself from the office for a break minutes to slow down and align yourself, is what Ryan is trying to encourage. P: Proceed with whatever you were doing with awareness and kindness. It’s right there in the Declaration of Independence. Mindfulness has been practiced for thousands of years; it encourages just that — happiness and kindness. It’s our right. It is time to claim our independence from depression and stress. Let’s occupy peace and banish anxiety from the shores of our minds.